Here you will find different links to organizations that provide helpful products and services. M.J. McLaughlin Company does not promote the use of chatrooms, and urges anyone who chooses to participate in chatroom interaction to proceed with caution. Never reveal accurate personal information to any individual in a chatroom. - AARP Grief & Loss: a collection of resources and an on-line support community. - National Funeral Directors Association: Frequently Asked Questions about grief. - American Cancer Society: Support to cancer patients, family and friends. 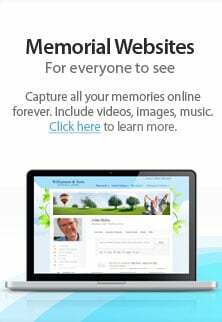 - Beyond Indigo: Death & Dying Grief Support – this site provides a wide range of grief related topics, a chat room, a message board, and links to related web sites. - GROWW.org: message boards, resource listings and secure chat rooms for the grieving. - WidowNet: an information and support resource for, and by, widows and widowers. - National SIDS and Infant Death Program Support Center: provides research, education, and support for families dealing with SIDS. - Bereaved Parents USA: a nationwide organization designed to aid and support bereaved parents and their families. - The Compassionate Friends: supports families who have experienced the death of a child. - SHARE Pregnancy & and Infant Loss Support: provides support to those whose lives are touched by the tragic death of a baby through early pregnancy loss, stillbirth or newborn death. - Fernside Online: an online resource for grieving children. - The Dougy Center: the first center in the United States to provide peer support groups for grieving children. They provide support and training locally, nationally and internationally to individuals and organizations seeking to assist children in grief.